“Mrs. 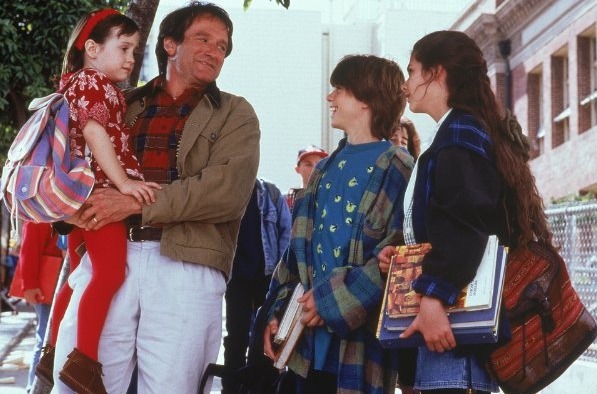 Doubtfire” actresses Mara Wilson and Lisa Jakub posted poignant blog entries this week, remembering their co-star and champion, Robin Williams. Wilson, who played the youngest sibling in the 1993 comedy, wrote, "Everybody grieves in their own way. When I heard about Robin’s death, I was shocked, confused angry, regretful, and above all, sad. All I wanted was to talk to my family and friends and cry. While Robin and I had not talked in a few years, there is no question he had a great impact on my life. He was as warm and talented as everyone says, and a joy to be around. It’s as if my favorite teacher died." Jakub, who played Williams' eldest daughter Lydia, wrote about how the comic actor “stood up” for her when she was kicked out of high school for leaving for five months to make the film. Lisa continued, "Robin stood up for me. He was in my corner. I was only 14, but I had already seen that I was in an industry that was full of back-stabbing. And it was entirely clear that Robin had my back… It taught me that you stand up for the things that matter. And even if your attempts fail, you tried. You told the truth. You took care of your friends. You fought back. She then prompted others to reach out to loved ones with depression. “Tell them they made you feel loved and supported. That they made you feel like you belonged somewhere and that you were not a freak. Tell them all of that. Tell them today."